Genealogy: the story of all our mixed genes! 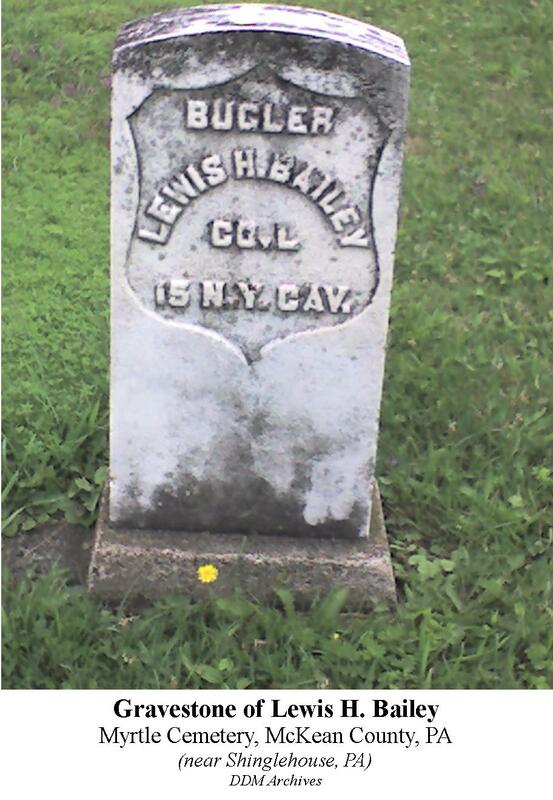 Lewis H. Bailey’s gravestone is toward the northeastern corner of the Myrtle Cemetery in the little village of Myrtle (McKean County, PA) not far away from the town of Shinglehouse, PA on PA-Route 44. Lewis was father of Luella Consuella Bailey White (1864-1952) who would give birth to Clara May White Mix (1888-1965) (my great-grandmother). His gravestone identifies his Civil War involvement. He was a bugler in the 15 N.Y. Cavalry, Co. L. with a rank of Private. BALEY, Lewis. White. Male. age 43. born about 1837. He is the head of his house. Married to: BALEY, Anna. Lewis was born in New York state. His father was born in New Jersey. His mother was born in Connecticut. Later, I discovered the 1890 Civil War Census listed him as “Louis H. Bailey” who served as a “musician.” Apparently he enlisted in the Union Army twice. First he enlisted in Co. D. 9th NY Cav. in Oct. 1861 and was discharged 9 Apr. 1862. His second enlistment began on 22 Dec. 1863 and he was assigned to the military unit identified on his gravestone. He is listed as being discharged on 9 Aug. 1865. Many of my notes from the time I was in high school are simple records of what I learned from my grandparents and great-grandparents, so I have no citations listed. Lewis’s parents are two of those unnoted bits of information: Lewis’s father supposedly was named Barvillai B. Bailey, probably born in 1833. Mother was Mary Jane Bailey, born 1845 and died 1902. I have no maiden name for her. Lewis & Anna are buried in the Myrtle Cemetery (McKean County, Ceres Township) just west of Shinglehouse (Potter County) PA. Their gravestones spell their last name as BAILEY.